Epicurean Catering is committed to providing the very finest food available to you and your guests for your lifecycle events. New arrival? Mazal Tov! Bring your newest family member to be given a Hebrew name and blessed by our rabbis on the bimah during Shabbat services. To arrange for a baby naming, please contact Devorah at 248-661-5700. Feel free to fill out our Baby Naming Form and a member of our team will be in touch with you! Mazel Tov on your beautiful simcha! Temple Israel is here for you! We’re happy offer our facilities for your son’s Brit Milah. To schedule space, please call Sandi Stocker at 248-661-5700. If you would like any of our clergy to be present, please reach out to their administrative assistants. For more information, please contact Miriam Baxter at 248-661-5700. Temple Israel has been celebrating this exciting rite of passage with families for over 75 years. We look forward to guiding you through this ceremony, marking the transition between childhood and adolescence. Traditional: These beautiful services are held in our recently renovated main sanctuary, and are often shared by two b’nai mitzvah celebrants. Our “Sanctuary Services” pay homage to our rich history and culture by following a traditional style service. Alternative: These b’nai mitzvah services are generally singles, can take place in any of our other prayer spaces at Temple Israel - including the Schmier Family Chapel, the Korman Hall or the Eisenberg or Wasserman Courtyards (weather permitting). An alternative format gives celebrants more freedom to personalize their bar/bat mitzvah service. Havdalah: Mark the end of Shabbat and welcome in the new week with a Havdalah service. These b’nai mitzvah services, held on Saturday evenings, end with a lovely havdalah ceremony led by the celebrants and their families. These services begin at 5:00 and 6:00 Saturday evening, and are typically single services. The 5:00 service typically takes place in the Schmier Family Chapel while the 6:00 service is in the Sanctuary. The Sanctuary service is paired with a party in the newly renovated Herman Hall. Experimental: Looking for something a little different? We want to help you make your bar or bat mitzvah ceremony your own, and we’re open to new ideas, venues and formats. Please feel free to reach out to us in advance in order to discuss new possibilities. For more information on Bar/Bat Mitzvahs, please contact Stephanie Brovenick at 248-661-5700. Our ninth grade students reconfirm their commitment to a life of Jewish learning by leading the congregation in prayer on Shavuot, following a year-long class with Rabbi Jen Lader. Hats off to our TI grads! Each year, Temple Israel celebrates the students who have graduated from our Roots high school program. The ceremony is planned and organized by the students, and takes place at the end of the school year. We are thrilled to celebrate your love and partnership with you! To schedule your wedding ceremony with one of our rabbis or cantors, please see our staff list and reach out to their respective administrative assistants or download and fill out the Temple Israel Auf Ruf form. 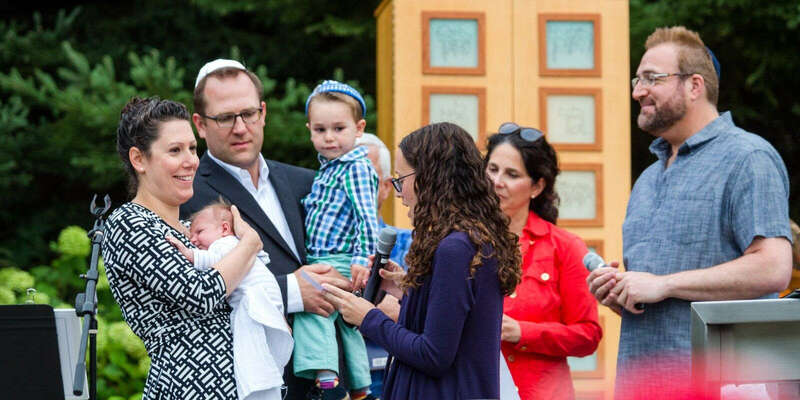 Couples traditionally receive a blessing (auf ruf) from our clergy before their wedding ceremony; you’ll want to reach out to the rabbi’s administrative staff for that too. If you’d like to hold the ceremony or reception at our social hall, please contact the Temple office at 248-661-5700. If you’re interested in exploring Judaism, please reach out to one of our rabbis by calling the Temple office at 248-661-5700. We offer counseling in tandem with an Introduction to Judaism class for anyone interested in becoming a “Member of the Tribe” - or simply learning more about Judaism. We’re proud of the fact that Temple Israel was the first Reform congregation in the world to build a mikvah. Our mikvah is used before weddings, holidays, and by those who’ve decided to convert to Judaism. We also offer creative mikvah ceremonies for untraditional life moments. For more information about using the mikvah, please call Kim Heraud in the Temple office at 248-661-5700. To discuss funeral services or if you have questions, please reach out directly to a member of our clergy who will work with you during this difficult time. Actual funeral arrangements are made through the funeral homes. We also offer several Bereavement Support Groups. For more information, see the Caring Community Support Groups page or call the Temple office. Temple Israel has a large portion of the Beth El Memorial Park Cemetery in Livonia dedicated to our members. Please contact Sandi Stocker at 248-661-5700 x127 for more information. Kaddish can be recited on the Yahrzeit (anniversary of death) of your loved one during a morning minyan on the day of, or at a Shabbat service. Yahrzeit reminders will be sent to Temple members in advance of the specific Shabbat when the yahrzeit is observed. Honor your loved one’s memory by including them on our digital yahrzeit boards where you can include their name, life story and photographs. 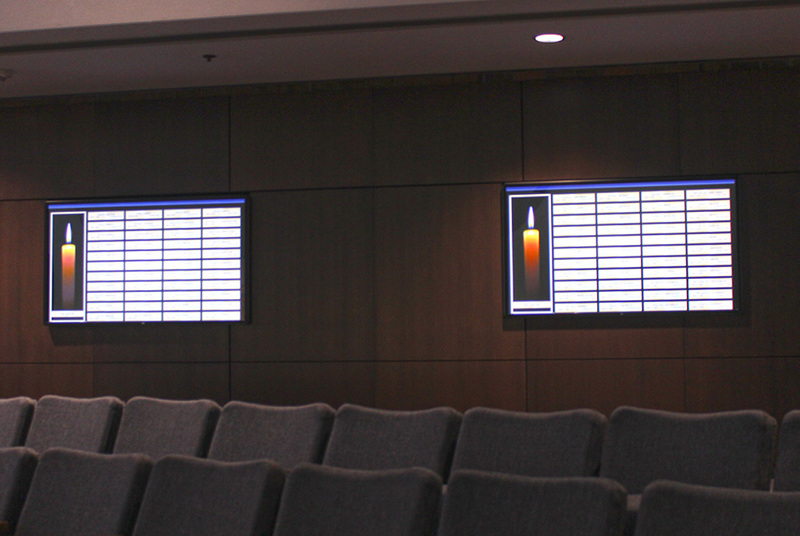 Our digital yahrzeit boards are located at the back of the sanctuary and in two other locations, near the chapel and the other just outside Korman Hall. You can also view online here. If a bronze plaque was purchased in the past for your loved one, their yahrzeit has already been added to the digital system. You now have the ability to enhance a yahrzeit by adding photos, a biography, and even link family members together with others who also have a digital listing. If you would like to memorialize a loved one at Temple Israel, you can order here.